Often, our industry can appear complicated, and yearns for simplicity. One such technique to glean simplicity is to develop frameworks which the corporate social strategist can then apply to achieve their business goals. 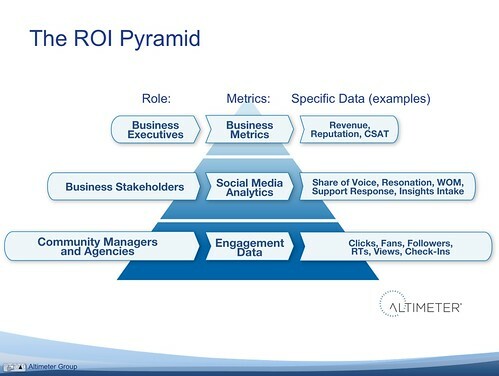 I’ve been working on this “ROI Pyramid” framework for a few months now, and am ready to share in greater detail than on my keynote at LeWeb (slides and video) where I introduced this to the public for the first time. 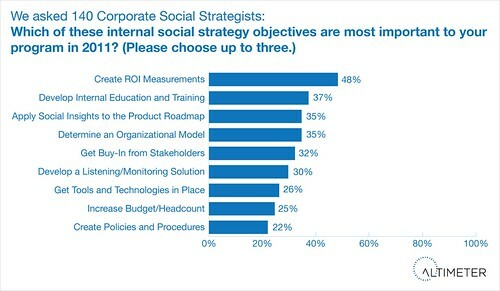 In our recent research report on the buyer of social business, (read research report: Career Path of the Corporate Social Strategist) we learned that measurement is one of the most important aspects to social business, in fact the top priority stated by 48% of corporations was “Creating ROI Measurements” for internal programs, (see data). Experimental mediums require proof they work. The corporate social strategist is constantly being challenge as they grasp more budgets to prove their efforts and teams are making a difference. In addition to proving these new mediums are worth the time spent, the corporate social strategist is being challenge by their peers in incumbent positions who may be giving up effort and budget to support social efforts. Down markets put greater scrutiny on spending. As spending across the board reduces in a recession, focus on proving new efforts is required by all parties involved. Those that can effectively measure improvements can make the business case they can truly obtain more budget. The Corporate Social Strategist Must Develop Frameworks Now. Most corporations are already forming in the “Hub and Spoke” formation (see data) which means a small cross-functional team is helping a variety of business units. Establishing a standard way of measuring now is important before corporations move into “Dandelion” where measurement strategy fragments into spokes. 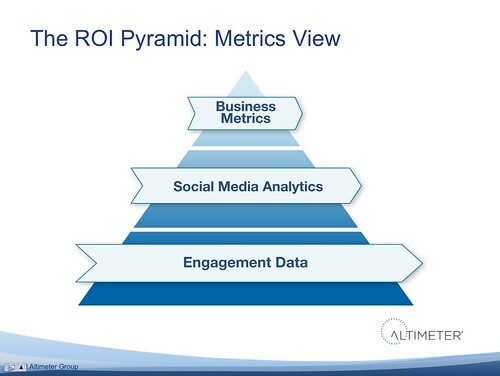 While we learned that measurement is the key, we found (see data in slide 20) that 65% of corporations are using engagement data as the top used metric, with only 22% using product revenue as a metric. Excess variety of data options, and disparate platforms. Due to the thousands of applications, dozens of social networks, and millions of combinations corporations are stymied by how to make sense of this disparate space. In addition to the variety of choices to deploy, each has a different set of ways to measure from fans, engagement, followers and the like. Technical limitations vast in a fast changing environment. As if the choices weren’t staggering enough, there are significant challenges to measuring. Corporations are unable to apply web analytics tools on third party sites they don’t have ownership on, and therefore are often relegated to manually counting data, or relying on one of the 150 brand monitoring platforms to scrape it for them. Hard to tie engagement to bottom and top line efforts. In addition to being a new program, understanding of this disruptive set of technologies causes friction. Additionally, social media is frequently known for driving awareness (second to ads) through WOM then through customer engagement through interactions –yet rarely tied to transactions or ecommerce which often occur on a disparate platform. Business Metrics Executives, and everyone else who supports them, which of course, is everyone. This is a roll up formula of Social Media Analytics. Use tracking software or referral traffic to infer how customer engagement moves down marketing funnel. Existing CSAT methods should also incorporate social channels, and measure a sample of sentiment from customer communities. Cost reduction is a formula based on reduced costs and time in these lower-cost channels. 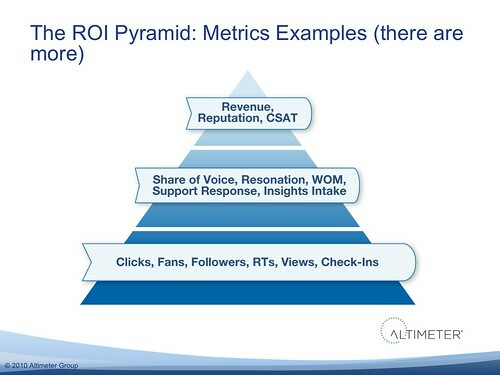 The pyramid is smaller at top as their are less metrics to give to busy executives. There’s really only three: increased top line, reputation, and reduced costs. Compare these lower cost channel to existing marketing efforts to get additional budget, and benchmark over time. Engagement Data Those who are deploying social media: community managers, developers, designers, agency partners, IT. This data is already created by many social tools, and a variety of analytics are already available to gather this info from brand monitoring to the analytics provided by Facebook and Twitter and others. Don’t forget to include traditional web analytics. Read our research report on Social Marketing Analytics to learn about the existing formulas. Don’t ever give this to executives until you’ve first given them business metrics or expect many months focused on ‘more followers’ without a business purpose. Corporations must develop a standardized way to measure first based on business goals. Next developing a standard way that the entire company and agency partners can think about measurement is key in 2011 as social business will fragment to every customer touchpoint. Start with a Business Goal in Mind. Expect significant challenges to occur if your social media efforts don’t have a business goal, so clearly you should first start with a purpose. It’s easy to spot when this happens as the goal will be on getting ‘more fans and followers’ rather than moving the business needle forward. Start with a clear business goal and define ‘what success looks like’ or don’t start at all. Give the Right Data to the Right Roles. Not all roles require the same types of data, and be sure to give the right type of data to the right segment. While all the formulas of the pyramid should be accessible by the corporation, understand the viewpoints needed from each vantage point. Frequency and Quantity of Data Varies in Pyramid Tiers. 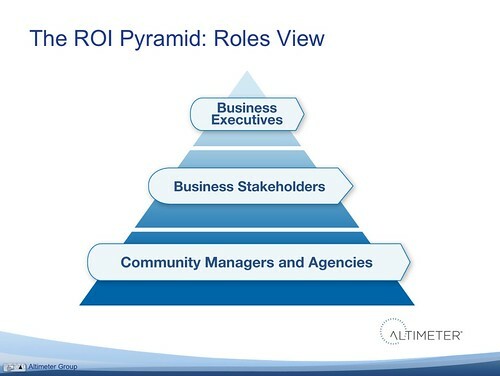 Recognize that executives need reports less frequently that the deployment teams, hence their size on the pyramid. Also, there is more data needed at the bottom tiers than at the top, remember the top tiers are roll-up formulas from bottom tiers. Know the Customization of Formulas is Required. This industry lacks any form of standards, so don’t wait years for an industry wide formula to appear as it likely won’t even apply directly to your business needs. Invest the time to create the social media analytics needed to support your business goals now, which you should expect will take massaging over a period of time. Benchmark Over Time and Cascade to All Spokes. The specific numbers aren’t as important as the trend lines over months, quarters, and years, yet in order to obtain these, you must start now. Looking at how these numbers trend over time will provide more insight to the teams involved. I look forward to hearing how you implement this framework in your measurement efforts, let’s open up the discussion in the comments below, please share this with your teams, agencies, partners, and staff. Thanks to Christine Tran and Asha for design help. Feel free to use these slides, flickr images, just provide attribution to Altimeter Group.